The two sample systems described in Part III of our Solar Power Tutorial series are essentially the same systems we have installed on our RV and sailboat. The RV system is pretty standard for full-time RVers (four 120-140 watt 12-volt panels and 440 amp-hour battery bank). The sailboat system is bigger than many cruisers carry (three 185 watt 24-volt panels and 710 amp-hour battery bank). Cruisers often install less solar power and rely on additional charging methods via engine alternator, and wind/gas/diesel generators. However, we have found our solar power alone is sufficient to live an ordinary house-like lifestyle on our boat (if we don’t use our standalone DC freezer). 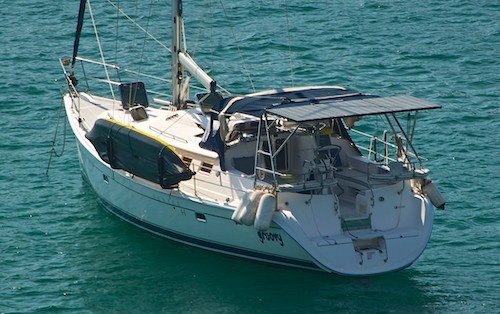 We lived for 10 mid-winter weeks in southern Mexico on solar power alone, without using the alternator once (it was broken), and still used two laptops, the TV/DVD, stereo, microwave, chartplotter, autopilot, anchor windlass and vacuum as much as we wanted. Our rationale for having enough solar power to live comfortably without alternative charging methods was: we didn’t want to store a lot of gasoline to power a gas generator; we had found that boats with wind generators often suffered from the whirring noise and vibration; and we didn’t want the added cost, installation work and maintenance of an inboard diesel generator. Solar power has been a great solution for us on both the boat and the fifth wheel. Part III described these two basic full-timer systems with just a cursory comparison of the solar panel choices. This page goes into more detail about the various options for sizing solar panels and suggests different ways to wire them. There are quite a few choices for solar panel configurations, each with its own pros and cons. But before choosing a panel configuration it’s worthwhile to consider how to deal with the large current that will be flowing through the wires. As much as 35 amps or more might be flowing from the panels to the charge controller and then from the charge controller into the batteries. This requires heavier gauge wire which is more difficult to work with and is expensive. However, there are several ways to reduce the amount of current in the wires. If the panels are wired in parallel, the amps produced by each panel are additive while the volts remain constant (Ohm’s law). Therefore, the cable leading from the connection point of all the panels to the charge controller and then on to the batteries will carry the full current load, or potentially as much as 35 or 40 amps at 12 volts DC. Heavier gauge wire must be installed to handle this large current load throughout the system. If there is too much current on a cable, then it will get warm (or hot), and lose some of its precious amperage to heat. In other words, if the wire gauge is too small, not all the power produced by the panels will make it to the batteries. It will dissipate as heat loss along the way. And at the extreme, there’s the risk of melting the shielding off the cable (highly unlikely). Larger wire is more expensive and is more difficult to handle because it is stiffer. “Larger” generally means 6 or 8 gauge wire and “smaller” is generally 10 gauge. The size is dependent on the current flowing through the wire and the length of the wiring run. A detailed chart for selecting wire gauge is given here. Note that some charge controllers can’t accommodate wire heavier than 4 or 6 gauge. If the panels are wired in series, the amps produced by each panel stay constant while the voltage is additive (also Ohm’s law). Therefore, the cable leading from the connection point of the panels to the charge controller will carry just the amperage produced by a single panel (7-9 amps) at 48 volts DC (if four 12 volt panels are installed in series), rather than the 25-35 amps at 12 volts DC that would flow when wired in parallel. Because there is less current, thinner gauge wire can be used throughout the system. In practical terms, most solar power systems on RVs and boats never reach their full potential current load. During the morning hours, before the sun gets high and powerful in the sky, the batteries get quite a bit of charge. Usually, by the time the sun is really cranking out maximum energy at noon — the time when the system could be producing max amps — the batteries have already gotten pretty well charged and are starting to ask for less and less current. So the charge controller has already begun to throttle the panels back a bit and less current is flowing through the system. Also, solar panels are rated for operating with the sun perpendicular to their surface, and anything other than a perpendicular orientation reduces their output significantly. In all months except May-July, the sun doesn’t ride all that high in the sky. We have rarely seen much more than 25-30 amps on either of our full-timer systems, although they are capable of 30 and 36 amps respectively. Another important consideration is that when a small fraction of a solar panel is shaded — as little as a 4 square inch area on a 2′ x 5′ panel — the entire panel stops producing power. That is because internally the panel is “wired” in series. When there is resistance, caused by shade, in just one portion of it the panel’s internal circuitry, current can’t flow through any of it. By extension, if the panels are all wired in series, when one panel shuts down due to a palm-sized bit of shade, then the entire array of panels shuts down. A tree branch or part of a boat’s standing rigging or mast/boom can cause the entire array to shut down if it is wired in series. Shade from the mast and shrouds on our three 185 watt panels. If the panels are all wired in parallel, a small amount of shade on one panel will only shut down that individual panel. Current will still flow through the rest of the panels and then through the rest of the system. We were persuaded by our solar panel vendor to wire our trailer’s panels in series so we could use small gauge wire throughout the system. We have experimented with shading a small corner of one of the four panels and were stunned to see the entire array quit working! However, almost everywhere we boondock we are in full sun. So, in the end, it doesn’t matter for us. Wiring our RV’s solar panels in series has worked out just fine. If, however, you anticipate camping under trees on a regular basis and you want to maximize the panels’ chances of getting access to the sun, wire the panels in parallel and use heavier gauge wire. On a boat, this series versus parallel decision is much more critical than on the roof of an RV. The mast, boom and shrouds often shade portions of the panels as the boat swings at anchor. Under sail the shading can be even worse. 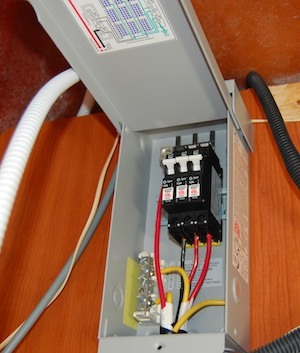 So the best wiring option on a boat is to wire the panels in parallel. However, the cable runs in a boat can be much longer than in a comparably sized RV. 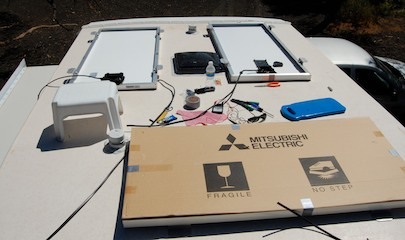 On our sailboat the wiring running from one end of the system to the other — panels-controller-batteries — is 45′. Why so long? The panels are high in the air on an arch at the back end of the boat, the batteries are at the bottom of the hull in the middle of the boat, and the all the wiring is routed so as not to be seen. Another way to tackle this issue of having a lot of current flowing through the system is to use 24 volt solar panels instead of 12 volt panels. When the voltage is doubled like this (24 versus 12 volts), the current is halved. So the current produced by 24 volt panels is half that of equivalent wattage 12 volt panels (the watts don’t change whether the panels are 12 volts or 24 volts). We chose to go this route on our sailboat, using three 185 watt 24 volt panels wired in parallel. Since the batteries are 12 volt batteries, the input side of the charge controller coming from the solar panels is 24 volts while the output side going to the batteries is 12 volts. Most large capacity charge controllers allow this kind of configuration. This means that the current flowing between the panels and the charge controller is half that flowing between the charge controller and the batteries. So, while the panels may be producing 14 amps at 24 volts, and those 14 amps may be flowing from the panels to the charge controller, the current will double to 28 amps at 12 volts when it flows from the charge controller to the battieries. While the wiring run between the panels and the charge controller can be smaller gauge (less current flows in that portion of the system), the last wire run between the charge controller and the batteries needs to be as short as possible and wired with heavier gauge wire to accommodate the larger amount of current. We made the mistake of placing the charge controller 25′ from the batteries at first and using 10 gauge wire (I suspect we didn’t explain our situation to the salesmen at the solar panel store well enough when we asked him for guidelines). When the panels were running at full power we lost about 10-15% of the power they were producing. Once we moved the charge controller to within 10′ of the batteries and replaced the 10 gauge wire with 8 gauge wire, we lost just 1.5% of the power between the charge controller and the batteries, which is considered acceptable. Tilting brackets make a lot of sense on an RV because an RV is parked in a stationary position. In wintertime it is possible to tilt the panels towards the sun (tilt them about 45 degrees). Most folks align the panels with the length of the RV and tilt them on their sides. This means that either the driver side or passenger side of the RV will be situated to face due south and the panels will be tilted in that direction. In most boondocking locations we find we can orient the rig any way we want to because there is so much space around us. In experiments one December with RVing neighbors who had tilting brackets, we found that their solar power system produced about 40% more amp-hours throughout the day. Their system was fully charged and their batteries were floating in the afternoon, while ours never reached the Float stage. Some of that may have had to do with their batteries being better charged to begin with in the morning (we have no idea if they were or weren’t), but it is a pretty dramatic difference nonetheless. However, to get the advantage of tilting brackets, you have to get on the roof to tilt each panel every time you set up camp, and then remember to return them to their flat position before breaking camp and driving off. An alternative is to keep the panels flat in all but the most dire circumstances (a week of cloudy winter days), but have one more panel in your system than necessary. Or don’t even bother installing tilting brackets at all. 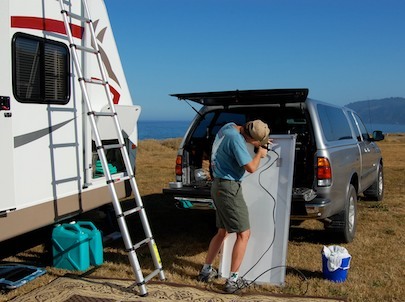 The trade-off is a few hundred dollars for an extra panel versus climbing up and down your RV ladder and fussing with the panels, as well as the risk that you might drive off with them raised up (we’ve seen plenty of people do that). Tilting brackets don’t make much sense on a boat because boats move around so much at anchor. Ours swings back and forth in a 90 degree arc. Also, the tilting mechanism for a lot of boats introduces shade across the panels at certain angles. On a boat, it is best to mount the panels as far from the mast and boom as possible and to focus on keeping the shade off the panels as much as possible by forcing the boom off to one side or the other while at anchor. A fixed, flat mounting position works best. Which Solar Panels To Buy – Flexible or Rigid? 12 or 24 volt? Monocrystalline or Polycrystalline? This is the end of our solar power tutorial series. We have lots of other info about solar power on this website. See the pages listed below to learn more. 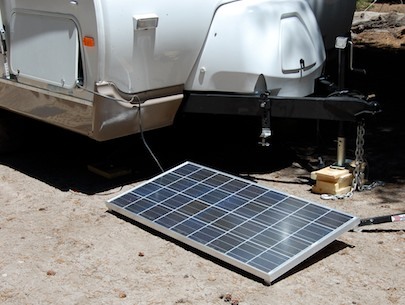 Designing a solar power system for your RV depends entirely on how you plan to use your RV. Are you RVing in summer or winter, or both? Are you staying in it for a week or two at a time or for several months at a time? Do you want to use a laptop for an hour or so a day, or do you need to camp out on it for 4-8 hours at a time? Do you hit the sack after an hour or so of watching TV or do you want to plunk down in front of it with a cocktail and stay planted there until after midnight? We didn’t install the panel on the roof at first. Silliness! Install it on the roof so you don’t have to think about it! As a general rule, more solar power is better. It is really awesome to have so much power that you never need to think about it. If you are planning to live in your RV for extended periods of time, want to use big appliances a lot and don’t want to be dependent on electrical hookups, get a big full-timer’s system right off the bat. However, if you are just weekending, vacationing, and living largely outdoors, get a small system. You’ll quickly learn what you can and can’t do. It is very easy to upgrade if you find you need more. Upgrading is mostly a matter of adding more and bigger parts. Not too many parts have to be swapped out. Mark connected the cable to the panel’s junction box before hoisting the panel onto the roof. 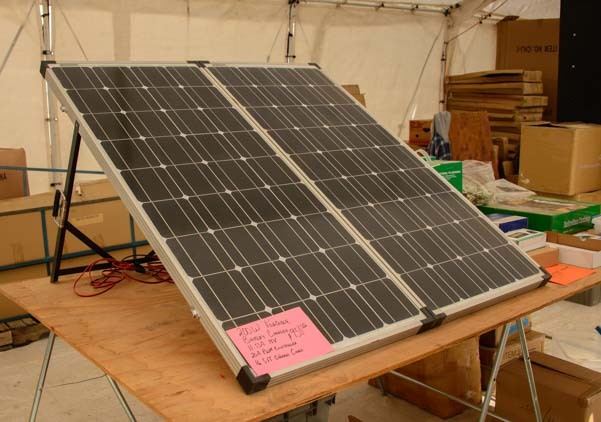 This page describes a “starter solar setup” which is good enough for heading off into the woods for a month or two of simple living in the summer. We used a system of this size for a full year, boondocking (dry camping) for months on end. We typically used the laptop or TV or stereo just 1-2 hours a day. We went to bed 2-3 hours after sunset. In the summer it was fully adequate for those kinds of light electrical needs. In the winter there was so little sun that we had to be very conservative. We used oil lamps at night, and we supplied extra charging for laptop, toothbrush, camera batteries etc. by charging them in the truck while driving around, using a portable inverter plugged into the cigarette lighter in the truck. (1) Install the solar panel on the roof. While working with the panel, keep it covered so it isn’t producing electricity. One easy way to cover it is to cut part of its cardboard packaging to size and tape it on. Mark drilled holes in the roof and used anchors for the screws in places where the panel couldn’t be screwed into a roof truss. He jammed Dicor lap sealant into the holes before putting the anchors in, then ran the wire and then put more Dicor on the whole works after it was screwed down. If there is a chance you might eventually want to use your RV in winter, install the panel on tilting brackets so you can tilt the panel towards the sun. It isn’t necessary to tilt the panel in the summertime, but it can be a huge help in the winter when the sun rides very low in the sky and doesn’t shine down on the panel but actually shines kind of across it from just above the horizon. Tilting the panel towards the sun might give you an extra 25% of total charge for the day in the wintertime. 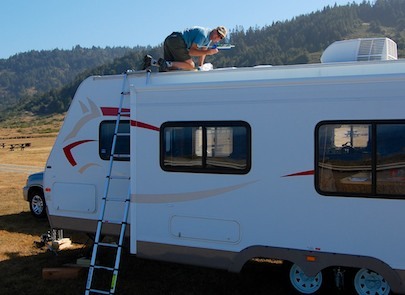 When you have tilting brackets, you have to climb up on the roof to tilt the panel each time you set up camp — and you have to remember to climb back up again to lower it down before you drive off. If you don’t think you want to do all that scrambling around on the roof, skip the brackets (and consider getting two panels instead, described in Part III of this tutorial). (2) Install the charge controller inside a hatch near the battery compartment. Connect one end of the wire to the panel (there are screws in the junction box on the panel that you screw the wire to). You can use duplex wire or two runs of single conductor wire for the positive and negative leads. If the refrigerator is not in a slide-out, run the wire down through the refrigerator vent to the battery compartment. Otherwise, run the wire down along the outside of the grey or black water vent pipe. Taping the wire to a metal snake and snaking it down behind the fridge really helps. We snaked ours down inside a piece of PVC pipe that we used as a kind of conduit to keep the wire away from the back of the fridge. If you do that, make sure the PVC pipe is quite a bit bigger than the thickness of the wire so you can get it through easily. At the charge controller, connect the wire coming down from the solar panel to the input side. Run a second wire from the output side of the charge controller to the batteries. It is best to crimp eyes on the ends of the cables. (4) Remove the cardboard from the panel. You should see an LED light on the charge controller turn green to indicate that it is charging. 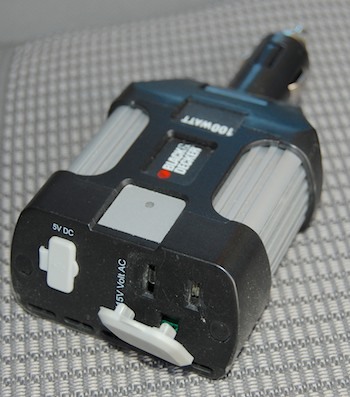 Use small, portable inverters plugged into the RV’s cigarette lighters for the TV, laptop, etc. Now your panel will start charging your batteries all day every day. It might even start charging them before you get out of bed in the morning! They will charge faster if you are in full sun. Just a little shade on the panel (like a single tree branch across one corner) will cause them to charge much more slowly. Plug your portable inverters into whatever available cigarette lighter outlets there are inside the RV. Whenever you want to watch TV, DVD’s or use your laptop or charge your camera batteries or toothbrush or whatever, plug the appliance into an inverter, turn the inverter on, and use the appliance as you would at home!! A successful morning’s work – the panel is permanently installed! (6) Add a second 12-volt battery to your battery box (this could also be Step 1, it doesn’t matter). The battery is your energy storehouse. You add energy to it when you charge the batteries and you remove energy from it when you use your appliances and lights. Think of your batteries as being a big kitchen sink. You fill the sink with water (charge the batteries) by turning on the faucet. You drain the sink (when you use your appliances and lights) by removing the drain plug. The goal is to keep the sink at least 2/3 full all the time. After a day of sunshine, as the sun is setting, your sink should be full. After an evening of watching TV and computer work, your sink should not be less than 2/3 full (batteries don’t like to be drained until they are empty). So you have to balance the size of your faucet (the total wattage of the solar panels), the size of your sink (the total amp-hour capacity of your batteries) and your appliance usage (how often and for how long you remove the drain plug) to make sure you don’t drain out more than you can fill up on a sunny day. Most RVs come with a single Group 24 12-volt battery. These typically store about 70 amp-hours of energy. Adding a second Group 24 12-volt battery will double the size of your “sink” to about 140 amp-hours of energy. As a very general rule of thumb, the total watts of your solar panels should be comparable to the total amp-hour capacity of your batteries. With 140 watts of solar panels in this system, it makes sense to have two 12-volt batteries to give you 140 amp-hours of battery capacity. Make sure there is room in the battery compartment for a second battery, as some RVs don’t have room for one. 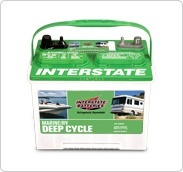 When shopping for an RV, if you plan to dry camp a lot, make sure the battery box can hold two 12-volt batteries. Wire the two batteries together in parallel. And that’s it for this whole system. Very very simple. The only limitation to this system is that you need to keep your TV/laptop usage fairly light and you cannot use your microwave, toaster, hair dryer, vacuum or air conditioning unit. However, it is a great starter setup to get your feet wet and learn to live in a solar driven home on the road. The easiest way to see how your batteries are faring is to use a multimeter and measure the voltage. We use a Sperry clamp-on meter that has jaws that can wrap around wire so you can measure the amperage flowing through the wires, if need be. 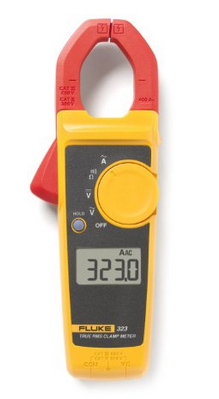 The Fluke meter is an even better unit because it is true RMS. Monitoring the battery voltage with a multimeter is not scientifically accurate, because batteries have personalities and memories and only tell the truth about themselves when they have not been under load for a long time and have been cleaned of their surface charge. However, checking your batteries’ health with a multimeter can still give you a good indication of how they are doing. Early in the morning, before the sun has gotten over the horizon, measure the voltage between the battery terminals. If it is 12.3 or higher, you’re okay. If it is lower than that, go outside and play and leave the indoor appliances alone for a day or two (and hope for sunshine). If that’s not possible, start thinking about finding a place to plug in. Likewise, check out the voltage sometime right after sunset before you get the TV or laptop going. If it is 12.6 or more, you are golden. If not, then rethink your evening’s activities a bit. A Portable Solution with NO INSTALLATION NEEDED!! Portable solar panel kit that folds into a hard shell suitcase! One very slick option for adding a small solar power system to your RV without going through the trouble of installing the panels on the roof is to get a folding portable solar panel kit. These wonderful kits are pairs of panels that are hinged together on the long side, and they fold together to form a hard shell suitcase that has a handle for easy carrying. The beauty is that the panels are naturally protected when you store them away, and they have built-in stands that support the panels at a tilted angle when they are set up, so you can aim them south for maximum efficiency. 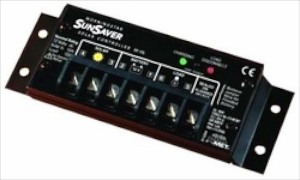 They come with a small solar charge controller so the batteries don’t get overcharged, and they have alligator clips that make it easy to clip the leads onto the battery terminals. This is not an upgradeable system, but if you are simply looking to enjoy some dry camping and boondocking in your RV and want a little solar boost for your batteries, this is an all-in-one 120 watt system that will get the job done! Most portable suitcase kits don’t come with an inverter, so remember to buy that too! Purchases at any of our Amazon links help keep us going. But don't buy anything yet. Finish the tutorial first! Part III of this tutorial describes ways this starter system can be upgraded to get a little more power. Return to Part I here. This page is the first in a series of four posts that explain the nitty gritty details of RV (and sailboat) solar power. The intention is to demystify the subject of marine and RV solar power and make it understandable for all, regardless of how technical you are or how much you know about electricity. The pages are linked together with arrows at the bottom of each page. Since we started traveling full-time in 2007, we have been living almost exclusively on solar power, first in a travel trailer, then a fifth wheel trailer and also in a sailboat. We don’t stay in RV parks or campgrounds or marinas, and on the rare occasions that we do, we don’t hook up to shore power. As of November 2018, we’ve spent over 3,800 nights living off the grid without electrical hookups in our rolling and floating homes. A solar power installation in an RV gives you the freedom to have full electrical power anywhere and at any time: at a rest area, in a parking lot, or at a National Forest campground. Likewise on a boat, you can anchor out for an unlimited time in bays and coves. Solar power runs without using any gas, is silent, doesn’t smell, and doesn’t require any setup (those shore power cords are mighty ungainly). Although we do have a gas generator in our trailer, we use it only when we want to run our 15,000 btu air conditioner, not for charging the batteries. It is a Yamaha 2400i. Wrapping your brain around solar power for a rolling or floating home can be confusing, but it is actually quite straight forward. Here’s the whole thing in a nutshell (wherever it says “RV” you can also think “sailboat,” as the principles are the same). Mark finishes three days of installing our fifth wheel’s solar power system while boondocked in Flagstaff, AZ. When an RV comes from the dealership, it usually has either a Converter or an Inverter/Charger in it so it can charge the batteries when it is plugged into shore power (via “hookups” or gas generator). Converters are cheaper and are factory installed on most trailers. 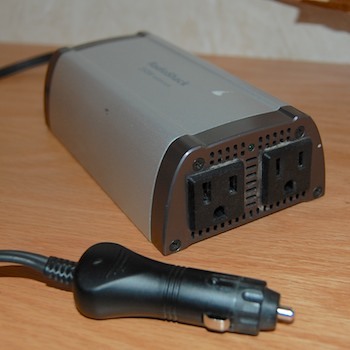 Inverter/Chargers are expensive (because they are dual-purpose, see below) and are factory installed on higher-end motorhomes. These appliances take the AC power coming in from the external source (hookups/generator) and use it to charge the batteries. They usually have a 3-stage charge cycle that charges the batteries quickly at first and then drops to a trickle charge once the batteries are close to fully charged. How do you charge the batteries when you don’t have shore power? That is where solar power comes in. When you install a solar power system in an RV, you add two things: Solar Panels and a Charge Controller. The solar panels are installed on the roof and they gather energy from the sun and pump it down to the charge controller. The charge controller keeps an eye on the batteries and takes only as much power coming from the solar panels as the batteries can handle. Early in the day, the batteries are hungry and the charge controller passes everything it can to the batteries. As the day wears on, the batteries become more fully charged and require less and less power. By afternoon, if the system is sized right for the way the RV is being used, the batteries throw up their hands and say, “No More! !” and the charge controller puts them into “Float” mode, a fancy term for a trickle charge. None of this has anything to do with running your TV or computer. It is only about charging the batteries up after they become depleted from use the night before. The solar panels will charge the batteries no matter where your RV is parked. If you are out hiking, or shopping at Walmart, or taking a nap inside, the batteries will be getting charged all day long. If you are at an RV park or marina with metered electricity, you can save a few dollars by not plugging in!! If you park under a tree, and the panels are shaded, you will get dramatically less power from the sun. A tiny bit of shade results in a huge decrease in how much the charge the batteries can get. We always park in full sun. Sailboats have a terrible time with unwanted shade from the mast and boom. When at anchor, pulling the boom over with the traveler and forcing it further out with a preventer helps a lot, but the mast is always a problem when the sun comes from forward of the beam. If you are sailing and heeled away from the sun or the panels are shaded by the sails, too bad!! So, on a sailboat, install more solar panels (more total watts) than you think you’ll need! 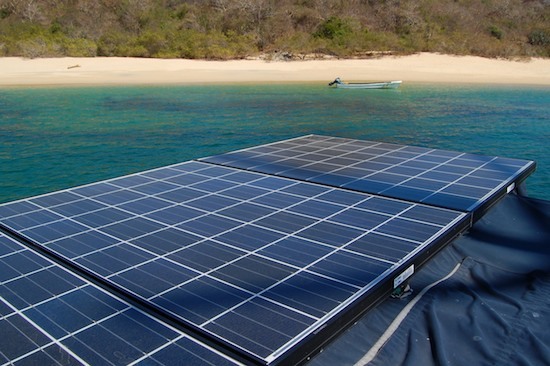 Which Solar Panels Are Best for an RV or Marine Solar Installation? When an RV comes from the dealership, it usually has a shore power cable so you can plug the rig into electrical hookups or into a gas generator. The shore power cable takes the AC power from the source (“hookups” or generator) and passes it straight through to your AC outlets. In other words, when the rig is plugged in like this, all the AC outlets, including “built-ins” like the microwave, become “live,” and you can run your AC appliances like the TV, computer, toothbrush charger, electric razor, hair dryer, vacuum, etc. If you want to have AC power without plugging into shore power, you have to have an Inverter. An Inverter converts the DC power that is stored in the batteries into AC power so you can run your AC appliances like the TV and computer. 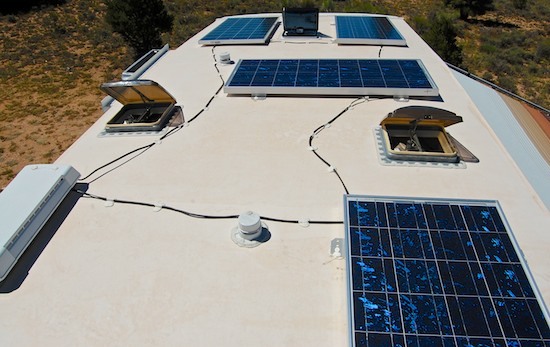 However, the Inverter is not technically part of the RV solar power installation. That is, it doesn’t connect to the solar panels in any way. You can use an inverter and not have any solar panels installed. However, unless you plug into shore power, your batteries will get run down by watching all that TV! That is why Inverters are lumped into the overall notion of RV solar power installations. They are a vital component if you want to dry camp. You can buy small, portable inverters for under $25 that will run your laptop from a cigarette lighter. These work on the cigarette lighters inside an RV just the same as they work on the cigarette lighter in a car. No difference. If you are puzzled by all this, get a little power inverter and try it out. I was totally enlightened the first time I turned on a small inverter in a car and saw the “charging” light on my laptop light up. A small 300 watt portable Inverters can run small 19″ LED TV too. Anywhere from 300-500 watts is fine for pretty much everything in an RV except the microwave, hair dryer, vacuum and air conditioner. You need an inverter of 1000 watts or more to run a small microwave, hair dryer or vacuum. You can’t run an air conditioning unit from an inverter unless you have a boatload of batteries, something that few RVs can support because of the weight. To run our air conditioning, we use a Yamaha 2400i generator. A 2000 watt inverter is fine for most things you might use. You just can’t run the big appliances (microwave, vacuum and hair dryer) simultaneously. If you are content using these appliances one at a time, don’t bother with an inverter larger than 2000 watts. We power everything on the boat except the microwave with a 600 watt inverter. We power everything in the fifth wheel, including the microwave, with a 2000 watt inverter. Most trailers do not come with an Inverter/Charger. They come with a Converter instead. So if you have a trailer, you will need to get an Inverter to watch TV. This terminology is unfortunate, as “Inverter” and “Converter” sound so much the same. However, they are almost the opposite of each other. A Converter charges the batteries, i.e., it takes AC power from an external source — hookups or generator — and puts that energy into the DC batteries to charge them up. 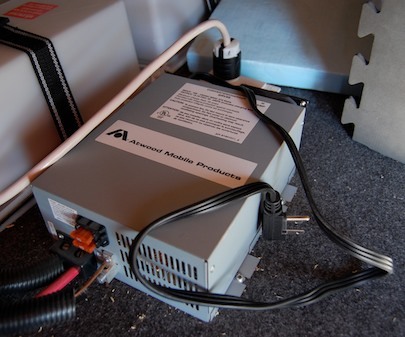 An Inverter takes the DC power from the batteries and creates AC power so you can watch TV. Wait, what was all that, again?? So, to recap: when you install Solar Power in your RV, you are tackling two problems: ( 1 ) Charging the batteries, and ( 2 ) Generating AC power from your DC batteries so you can watch TV, surf the internet, and charge your camera batteries. 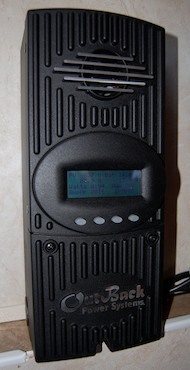 Solar panels and a Charge Controller to charge your batteries all day every day. An Inverter to create AC power out of the DC power that is stored in your batteries so you can use the TV and computer. You can use little portable ones that plug into cigarette lighter outlets and/or you can install a big one. If your rig came with an Inverter/Charger, you are halfway there and need only to add the components for charging the batteries (Solar Panels and Charge Controller). Next Up: What you need for a small RV solar installation that’s good enough for summer weekends, vacations, and simple living on an extended tour.